Have you ever noticed each region has its own style of cooking and some dishes immediately come to mind when you think of various places? For instance, Maine has its lobster roll. Chitown has its deep dish pizza. The South has its fried food. Louisiana has its gumbo. Well, Texas has its Tex-Mex and it sure is good. 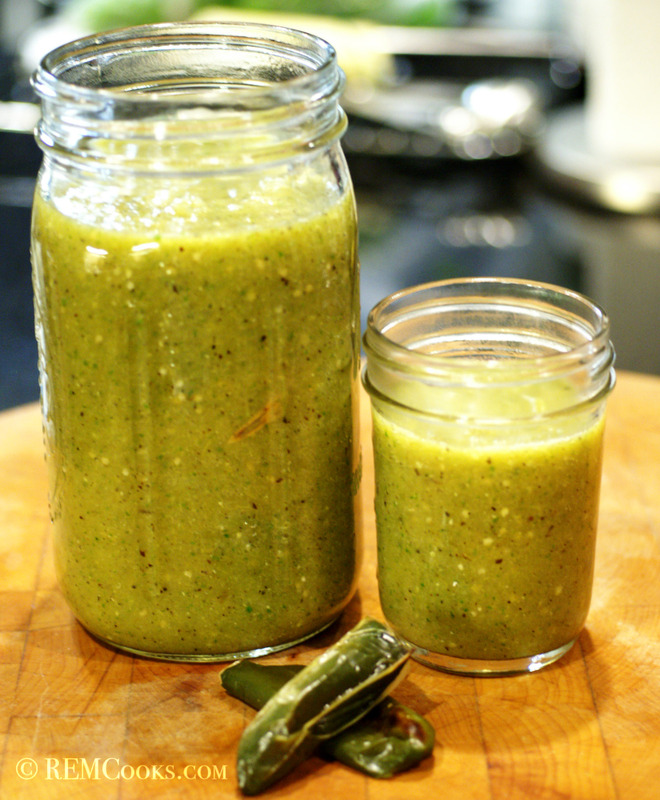 This recipe is for a Mexican style salsa verde (green sauce). Beautiful, green, tangy and slightly spicy! Just the way we like it. Not surprisingly border states often reflect the foods of their neighbors. This is especially true in Texas inasmuch as Texas once was a part of Mexico. As such the flavors from south of the border are very prevalent throughout the state, however, most of the food is not traditional Mexican food. For instance, if you have been eating fajitas and nachos and calling them Mexican food, they’re not. These delicious meals are Texas-based inventions that make use of traditional Mexican ingredients and flavors in deliciously different ways. Being from Texas you can’t help but eat, like and learn to fix Mexican food or some variation thereof. Now, what do you think of when you hear salsa? For most people, salsa is nothing more than a mix of fresh chopped tomatoes with spices, some onions and maybe a few jalapeños. Salsas, however, are as varied as all of Latin America. There are red chile based salsas, red tomato based salsa, green tomatillo based salsas, raw (cruda), chunky salsas like a pico de gallo, and fruit based salsas that are both sweet and spicy. Salsa’s also have their own unique terminology, salsa verde, salsa fresca, or even salsa cruda. Salsa Verde has its origins in Central American cuisine. It can range in spiciness from mild to mouth-searing, depending on how many Serrano peppers you use. Its simplicity is part of its beauty, consisting primarily of chopped tomatillos with Serrano peppers, cilantro, salt and lime juice added. Many people use salsa verde as a topping for tacos, burritos or quesadillas; however, it is exceptionally versatile and can be used in a variety of ways. Now, a few of you may be asking “what is a tomatillo?” Well, it’s also known as the husk tomato, jamberry, husk cherry, or Mexican tomato. It’s that funny looking green tomato with the leaves wrapped around it that you always walk past wondering what do you do with that. Although it is a distant cousin to a tomato, it is more closely related to a cape gooseberry. Ripe tomatillos can be green, purple, red or yellow. 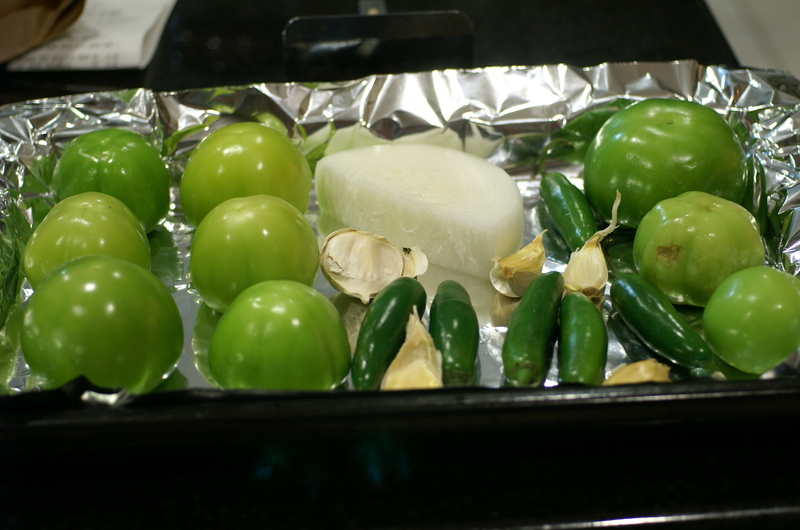 The flavor of the fully ripe tomatillo is very sweet and adds a wonderfully bright taste to salsas. This is a wonderful recipe for salsa verde. To add a little depth of flavor and some character to the salsa, we roasted the veggies. Give this basic recipe a try. Use your imagination and try your own variation depending upon what you want to fix to go with it, i.e. chicken enchiladas in salsa verde, costillas (ribs) in salsa verde, etc. 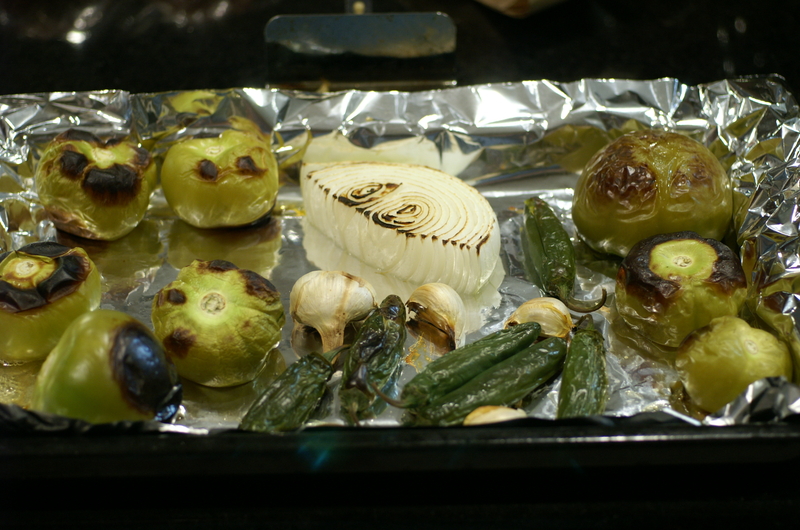 Place the tomatillos, onion, garlic and Serrano chiles on a pan and place under a broiler. Roast until the veggies begin to char. Turn the veggies and continue to roast under the broiler. 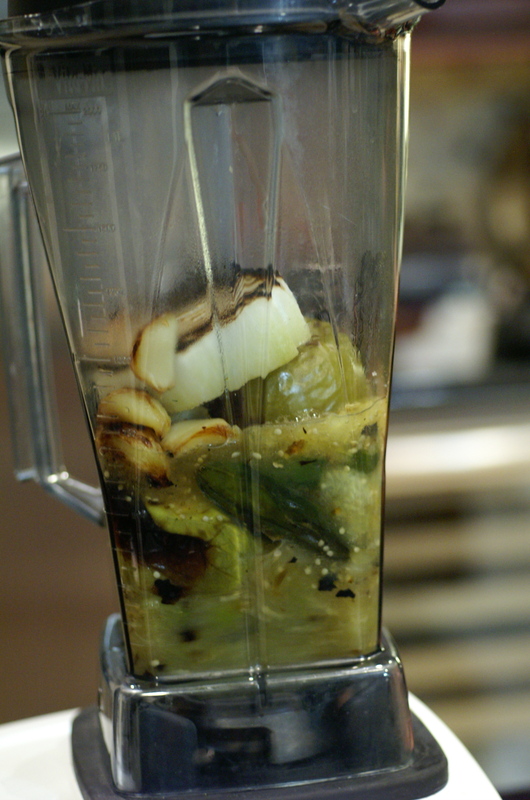 When the veggies have roasted, remove skins from garlic cloves, and place all veggies in a blender along with salt. Puree again. Viola! You’re done. Pour salsa in jars and store for later use. How simple is that? Those vegetables look incredible freshly roasted. 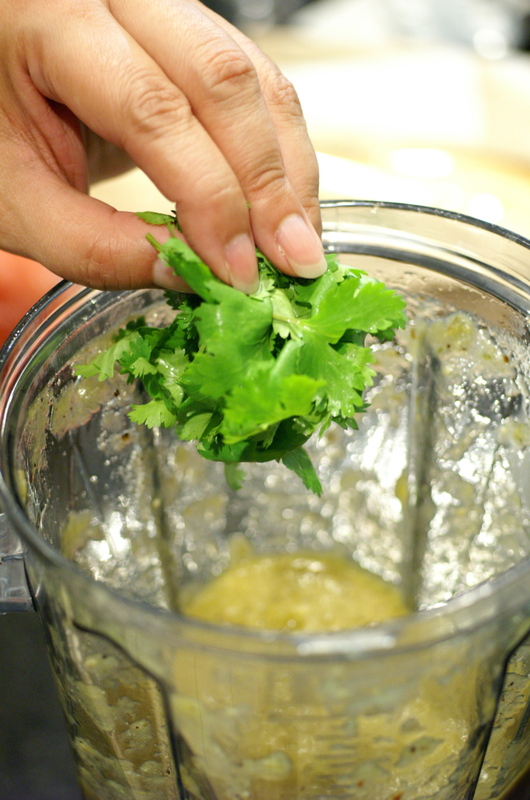 Your salsa surely tastes better because you took that extra step. WIth all of those jalapeños, though, I fear this may be a bit too spicy for me. If I make it, I’ll just use a couple less. Mum’s the word! Thanks so much for giving it a try and letting us know what you thought. We are always tickled you like our food. 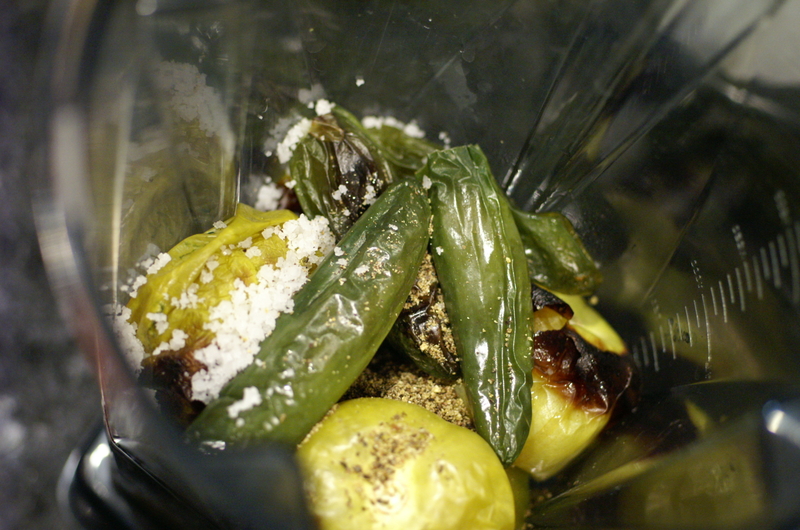 You can always adjust the heat using jalapeños or reducing the number of serrano chiles. Baby Lady suggests blending everything together except the chiles and then throw in one at a time, to taste. Her idea sound like the safest! I made another batch of salsa tonight (yes, we loved it THAT much!) but with half the amount of chilis. I liked it, my husband said it was too mild. I have 2 extra roasted chilis so will probably blend in one more, I think I can handle that. We made crunchy tacos with leftover chicken, refried beans and a new batch of salsa verde. Still delicious, but simmering the salsa with the remaining broth from the chicken made it more rich and flavorful.